1890 why wasn't I born in you?!! Ever since I started These Shallow Graves, I have been flimflamming, pick pocketing, and screaming headlines on the streets just like a newsie! What I loved most about this book might surprise you, it did me that's for sure. 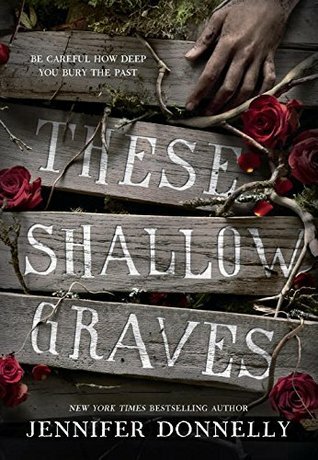 These Shallow Graves is a murder mystery, but that's not the story I fell in love with. I figured out the culprit really early on and I mean like within the first few chapters, but I think that was supposed to happen. By letting her readers know early on who not to trust she let us open our mind and explore her world. I didn't have to keep guessing and looking for clues they were already there so I got to fall in love with Jo, Eddie, Oscar, and Bram and their world. I have never been a fan of knowing the mystery outcome early, but for this it really worked. Plus there were so many side stories woven throughout that if I had to focus too hard on the mystery I really would have missed out on some incredible storylines and emotions. This doesn't mean I didn't like the mystery part at all. I liked it and I was intrigued by it, but the world Ms.Donnelly has created took over for me and that was what held me. The story is a complex one filled with business politics, murder, ruthlessness, and danger. The central story line though is about Jo trying to find out what really happened the night her father died. When she learns certain things everything she knows falls a part and what started out as a not so simple murder mystery turns into a dangerous game with more than one life on the line. I really liked how each story wrapped around each other and were all affected by the others. I didn't lose any story lines throughout and that was amazing. I also feel like the romance was a nice touch. I'm not loving romances at the moment, but man this book sort of made me rethink that. Jo and Eddie were a great pair and I really enjoyed seeing their story unfold. It wasn't an easy one and I think it was woven into the story brilliantly. It wasn't the main focus so the glimpses we get were strong and made me want more. I have to say these characters that Jennifer Donnelly has created are some of my favorites. I really don't want to let them go! I honestly fell in love with each and every one of them and I'm craving just one more chapter so that I can see them again. And as a side note I really want a book about Oscar! I would even take a novella! Just anything! I loved him and his quirkiness!! Jo and Eddie were also a delight and I loved how well they worked together. Eddie treated Jo as an equal and she needed that to see there was life beyond what was expected of her. Jo did what she had to do even if it was dangerous and yes she did some pretty dangerous stuff, but I respected her and her decisions. I will not forget this book anytime soon and I can guarantee I will pick up Ms. Donnelly's other works. She definitely knows how to craft a world that I want to live in! Be sure to check back this month, Jennifer is stopping by to answer a few questions!